I started the process of replacing my crappy Audio 15 with an Alpine ILX-007 and some Hertz 2 way component speakers. Based on some posts here and other info I have purchased an Axxess XSVI-9005-NAV interface and a ASWC-1 steering wheel control interface. There are a couple of 4 pin plugs on the OEM radio, one is blue and one is auburn/magenta which I can't figure out what they go to (see picture). I have identified the black and green coax plugs (antenna and backup camera) but can figure out the others. I have Nav, Sirius Radio and the USB plug next to steering wheel so I suspect these connectors may be involved with these? My second question pertains to wiring the speakers. I have pulled the tweeters, door speakers and dual coil speaker in the middle of the dash but am a bit stuck about the best way to wire. 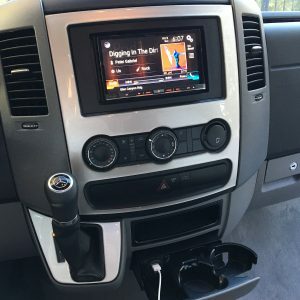 Is the center dash speaker wired in series with the door speakers or in parallel? I am hoping I can wire my crossover using the inputs going into the center dash speaker and use the output wire to go to the door woofers. If I can do this I would tape off the OEM tweeter wires and run new wires from the crossover to the tweeters. Anyone know where the woofer and tweeter wires connect? I am trying to avoid dismantling the dash anymore and digging in the wiring harness to find the woofer-tweeter wire junction. Re: Audio 15 Replacement and speaker wiring ? The tweeters and woofers are wired in parallel. There are only four speaker wires exiting the head unit, Left +/- and Right +/-. The center dash speaker I believe is a dual cone unit and is wired to both of the left and right. I disconnected all four speakers. I cut the wires coming out of the head unit and soldered rca cables to the output and ran them to my amps under the front right seat. I then ran the output of the amps back to the cut speaker wires and soldered them behind the head unit. I installed the woofers in the doors with Hein adapters and cut holes in the A pillar for the tweeters. I placed the crossovers in the doors. So I used the existing wire from the back of the head unit down to the door speakers where I placed the crossover. I then ran new wires to the tweeters and the woofers. How does the Audio 15 perform as a "preamp only" head unit? I'm considering this approach also. In this day and age, virtually all my music sources will be from USB, SD or Bluetooth. Decoding MP3 and getting them up to a voltage level suitable for the external amps isn't a big job so I'm hoping/expecting the Audio 15 would provide reasonably high signal to noise for such use. Then the quality of my stereo comes down to my choices of amps, speakers and speaker locations. I think it is decent as far as a head unit for audio. The nice thing is that the steering wheel controls, backup camera, USB, bluetooth and phone all work pretty well. Found out that the mystery connectors are FAKRA High Speed Data (HSD) connectors which are used for GPS, LVDS and USB applications. Unfortunately the color coding is generic unlike the FAKRA coax plugs used for antennas and such. Blue tends to be used for GPS so I will try to access the back of the Becker Map Pilot to see if the plug color matches. Becker 15 Farka connector on rear of chassis. Green is rear camera. Two wires only. Camera has constant 12vdc when switch is on. Thanks Borch! How did you decode these plugs? Very little info in the ether about these. Will replace the USB for the new head unit input unless I can find an adaptor. I have access to electrical drawings. I have attached some speaker drawings. Please note speaker polarity for best fidelity. This information is based on my 2014 Sprinter. The center dash speaker I believe is a dual cone unit and is wired to both of the left and right. That it is correct. It is a 3" speaker and there really aren't any good replacement options.